I have been busy with some sewing for a change! It feels so good too. I've really left things close to the wire with my mouthy stitches swap tote. It was about time I got moving on something! I'm finally feeling a bit more human since all the charm sorting, and the Mouthy Tote was top of (a very long) list. Lots of scraps flying about the cupboard (they got everywhere!) and some furious trimming, pressing, piecing, trimming, measuring.... Eventually (admittedly 2 or 3 days later) I came up with these panels. I know, I know, stoooooopid photo, makes the finished panels look like something I've ditched!! Anyway... It would appear that the Mouthy participants are all massive Anna Maria Horner fans... so I guess I'm doing the AMH triangles pattern after all. Oh well, good excuse to get a 12 x 16ths bundle of Field Study then eh?! 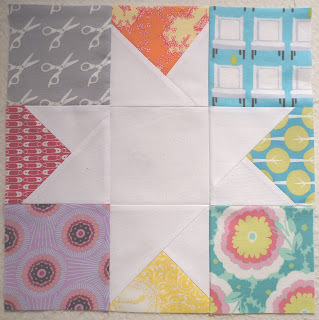 Another thing I got done was my Modern Stitches Bee October blocks for Emily. Scrappy wonky stars. I asked Emily if she'd like them mixed up a little, just so that when she pieces the top they aren't all in totally regular slots. (She said yes.) 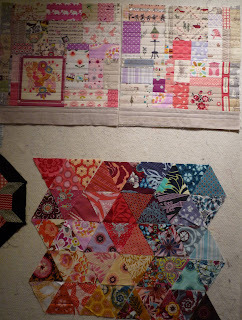 Just thought I should explain so you didn't think I was sending off half done, unfinished blocks! 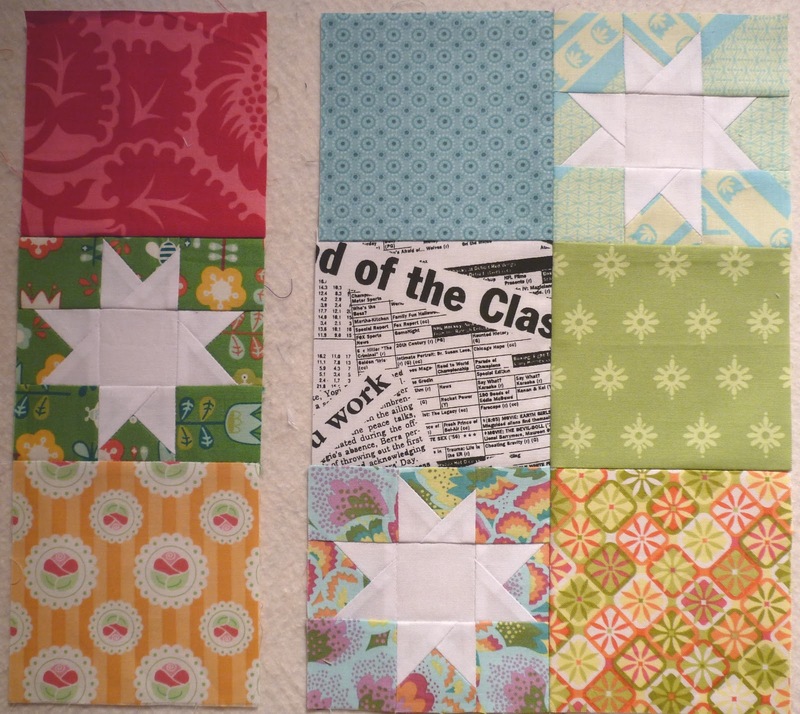 Oh these blocks were a joy to make! Fun, not too taxing...but lovely finish in an achievable amount of time for me too. One day cutting all the bits, then one session doing the big block and two sessions (evening with a tea break and nap!) 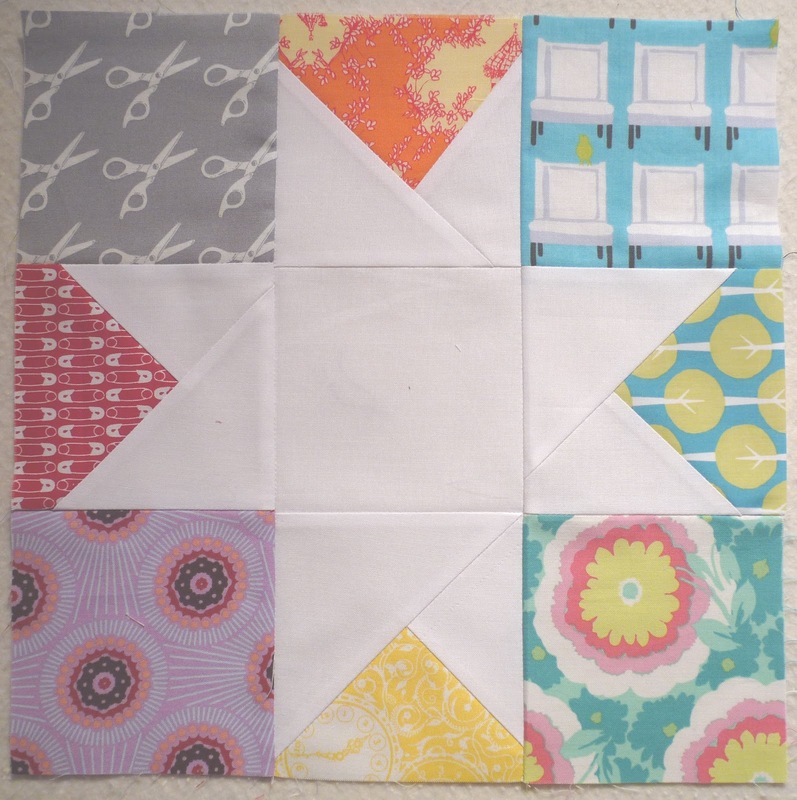 to do the second blocky bits. Nice blocks, I made stars last night too. I love your scrappy panels and the triangles too. What a great idea to leave some blocks in bits. Love them! Oh you have been productive and I love your 'specials' panels. So I guess the tote isn't for me them. Bugger, I love those panels! I love the wonky stars too. A most productive few days I must say! 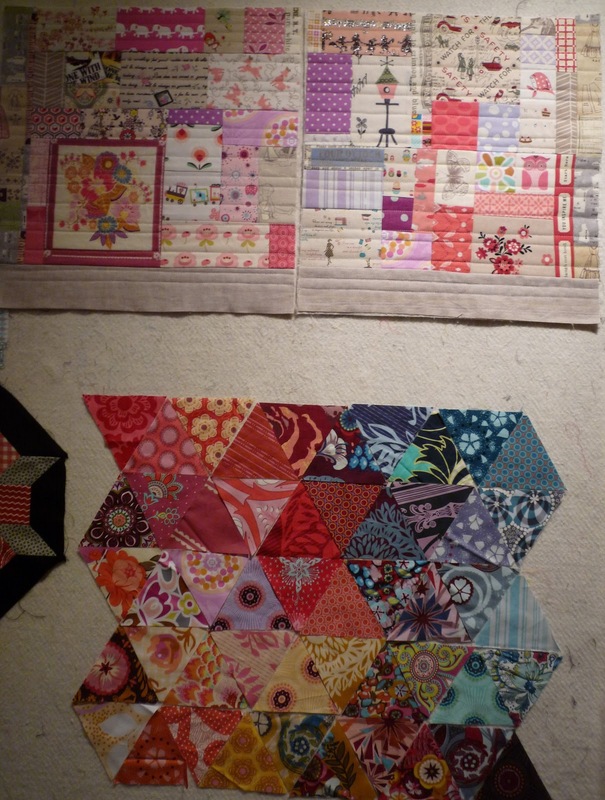 Praying to the quilting goddesses that those Field Study triangles are coming to the Orient!! Those itty bitty stars weren't taxing?! They look great. 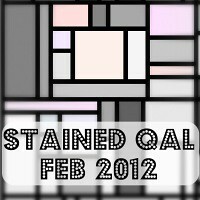 I loved the panels (recognized a few of the fabrics!) and personally prefer them to the triangles, but that's just my taste in fabrics. The main thing is that the recipient is happy. i like the scrappy panels. i should really dig out my scraps and do something with them. I adore your 'specials' panels - I think you should make yourself a tote/giant zipped pouch from them, you could keep a lot of EPP in a pouch that size ;o) The stars look amazing, you do seem to work well under pressure!! Oh I love your specials panels! I think we all have a big pile of fabric that we are 'saving'!! Oh I adore the special panels!!! You have a pink kerchief girl!!!!!!!!!!!!!!!!!!!!!!!!!!!!!!!!!!!!!!!!!!!!!!!!!!!! !